Bear Grylls brings his renowned spirit of fitness and adventure to Winton House, Pencaitland on the 3rd September 2016 (9am – 5pm). This will be a great family days out at the first ever Bear Grylls event in Scotland. The obstacle course event will feature: 5k and 10k Survival Races, BG Kids Race and the BG Outdoor Festival, all on the beautiful Winton Estate. The day is being MC’ed by “Bear Grylls: Mission Survive” 2015 winner, Irish model, presenter and DJ, Vogue Williams. Apiring ‘Survivors’ will experience ultra-dynamic, Bear Grylls-inspired obstacles packed with exciting and fun challenges, designed for all levels of fitness. 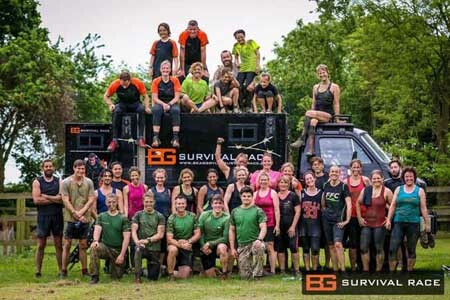 The recent BG Survival Race in Cambridge attracted 7,000 participants despite gale force winds. Thousands of visitors are expected at Winton on Saturday but there are still places for aspiring ‘survivors’ so why not sign up now; be inspired by the success of Team GB, challenge your fitness and have a great day out. Participants will be encouraged to survive by completing Bear Grylls survival challenges, including fire-lighting and air rifle shooting, as they uncover their inner ‘Survivor’ through Jungle, Mountain, Desert & Arctic zones. “This is about empowering people to test and extend their adventure fitness, using the type of obstacles that I have often encountered in the wild. We all have an edge, and this race is designed to push those physical and mental limits, to there and beyond,” says Bear Grylls. The races are a range of challenging survival scenarios including jungle, mountain, desert and arctic environments, encompassing all manner of physical and psychological obstacles to overcome. This is not simply ‘another muddy run’ it’s so much more. Adding to events is the fact that the settings for these epic adventures are in some of the UK’s best locations. More details on Winton House’s website or on the Bear Grylls website. The lucky participants will experience a range of ultra-dynamic obstacles all inspired by the tremendously adventurous life of Bear Grylls. For competitors, to reach the finish line of the 5k or 10k course is a major achievement. The 5k Survival Race is packed with exciting and fun challenges, designed for all levels of fitness and it is a fantastic event to tackle individually or better still in a group with friends. While a physical element is required, the 5k survival race is also a fantastic opportunity for those with limited experience of this type of event to push themselves and make a positive impact on their own health and fitness goals. The Bear Grylls Kids Race is exactly as it sounds; we want to see all of our little ‘Bears’ challenging themselves at the BG Kids Race. Open to children aged 4-13, participants will make their way through the jungle, desert, mountains and arctic all in one course! This unique part to the day underscores the entire ethos of the survival race; getting together with friends and family and spending the day doing something unforgettable. From gourmet pop-up food stalls to a fully licensed bar, there are also craft shops, bush survival demonstrations on the main stage and a ton of festival entertainments for all ages including a bungee jump, Water-zorbs, Segway and even live music, para jet flying shows, falconry and…for the brave, a bush-grub eating contest, plus so much more…There will also be race-viewing points within the festival and the opportunity to dabble in some of the Survival Challenges featured in the race.